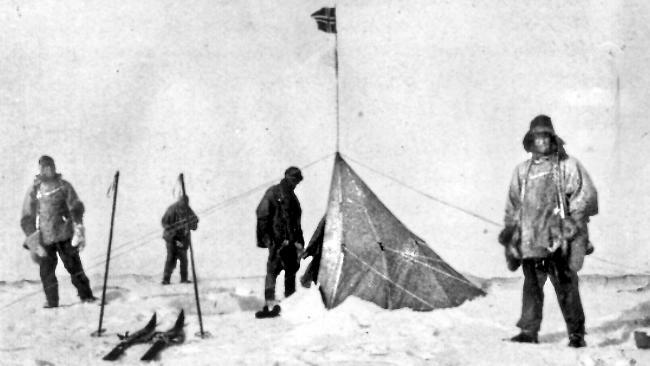 British Antarctica expedition at South Pole in 1912 standing near Roald Amundsen's tent. From left to right: Robert Scott, Titus Oates, Edward Wilson, and Edgar Evans. Credit: The Australian. One hundred years ago this winter, two polar expeditions disembarked on the northern edges of the Ross Ice Shelf in Antarctica with the goal of reaching the South Pole. One party, led by Norwegian explorer Roald Amundsen, reached 90º S on 14 December 1911. The second party, led by British officer Robert Falcon Scott, arrived a month later on 17 January 1912. Amundsen and his men returned to announce their victory, while Scott and his party of four men died on the trek back, succumbing to starvation and cold. The meaning of Antarctic exploration has been cast in the forge of the Scott-Amundsen race ever since. There are good reasons for this. The event was significant geographically: representing the attempt to erase the last, substantive terra incognita from the modern world. It was also important politically: highlighting the competition between different Western powers on the eve of the Great War. For historians, it offered a way to demarcate the eras of exploration: signaling the key event in Antarctica’s “Heroic Age” and capping the end of a century of intense polar exploration. Lastly, it offered a great story: in the great race to the South Pole, writers have found heroes, villains, experts, and bumblers toiling on a landscape both severe and sublime. Yet Scott and Amundsen were not the first to understand Antarctica’s power as a canvas of the imagination. 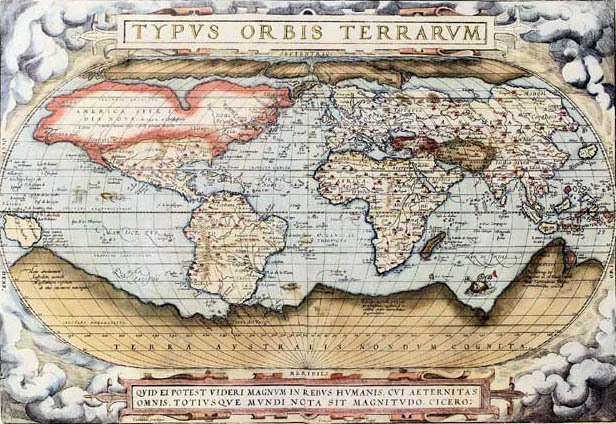 Three hundred and forty years before Robert Scott and Roald Amundsen raced across Antarctica, this southern world filled the mind of Abraham Ortelius as he crafted his magisterial atlas, Theatrum Orbis Terrarum (The Theater of the World). Terra Australis, as Antarctica was then called, sprawled over the page of Ortelius’s world map. Its ragged coastline reached South America and brushed up against the shores of New Guinea and the Spice Islands. It was a polar continent, but it was also a tropical one, crossing the Tropic of Capricorn in the western Pacific to come within twenty degrees of the equator. Even accounting for the distortions of map projection, Terra Australis was a vast place, dwarfing the other continents of the world. Despite its imposing form, however, Terra Australis was built on fragile empirical foundations, something that Ortelius knew when he published the atlas. 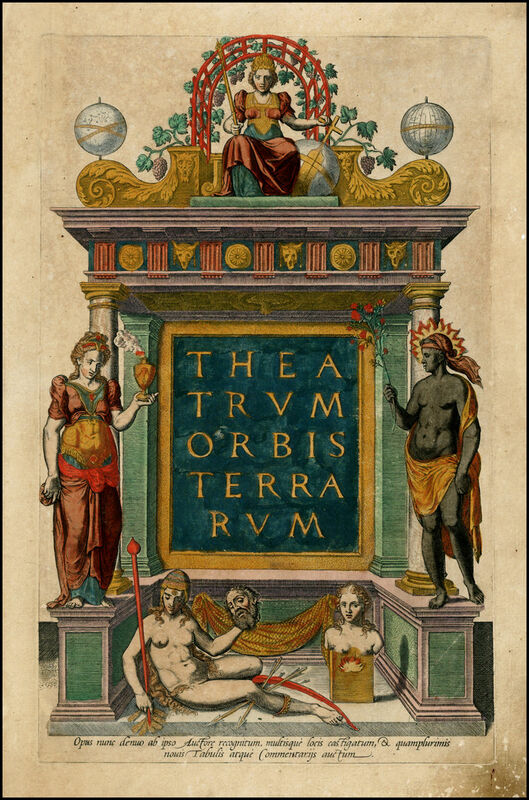 The title page of Theatrum, which depicts the continents in allegorical form as goddesses, expresses his ambivalence about the southern continent. At the top of the page, Europe sits on her throne, while Asia and Africa, semi-clothed and semi-barbarous, stand beneath her. 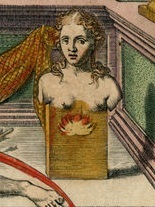 At the bottom of the page reclines America the cannibal, naked except for her loin cloth. Terra Australis stands next to her, a figure incompletely revealed in a block of marble, a continent glimpsed but still unknown. In seeing explorers as sculptors, Ortelius was probably thinking about the sculptors of his day, artists like Michelangelo who had been moved by the spirit of Neo-Platonism and who saw it as their task to “liberate the figure imprisoned in marble.” From this perspective, the congruence between the artist and explorer was easy to see: they were both the messengers of objective truth, vectors of knowledge rather than its creators. Terra Australis waited for the explorer to chisel her out of the hard whiteness of high latitudes, revealing her true form to the world. Yet Ortelius’s allegory of Antarctica carries different meanings today, a time when artists do not often describe their work as the liberation of perfect forms or pre-existing ideas, but as creative and subjective acts. If sculptors fashion their figures rather than reveal them, the half-rendered figure of Terra Australis has a different message. In order to bring this continent to life, the allegory suggests, the explorer must envision it and give it shape. Its storms, mountains, and coastlines – its very identity as a place – emerge as the vision of its creator, subject to ideas, expectations, and beliefs. The marble is not silent, of course. The continent of Antarctica, like every artistic medium, carries its own powerful agency (as Scott and his party would attest) imposing its own limits on the form revealed. Had Ortelius been alive in 1912, the year of Scott and Amundsen’s great race to the South Pole, I suspect he would have felt the impulse to finish his Antarctic goddess, to give the continent her final unchanging and eternal form, installing her in his allegorical pantheon like a stone deity in the temple of Olympus. Yet the continent of Antarctica is not so fixed. While its coastlines and topography are now stable enough to secure within the pages of the modern Atlas, its meanings are not. f you would be so kind, I would like to request the use of the image you posted of the road through green country land. It would be used for a non-profit Christian girl’s camp. I would email an attachment of the flyer if I could. It is themed “An American Road Trip”. Thank you for your attention to this. It is a beautiful image. I’m not sure which image you mean. I should tell you that I do not own the copyright for any of the images on the blog. I find them on the internet and — since I don’t make any money from my blog — post them under “fair use” policy. Good luck with your flyer. I just watched a TED talk about the guy who trekked on foot to the South Pole, Ray Zahab. Craziness! One of the most fascinating findings of the census was that the octopus is a distant descendant of an ancient species that lived in the frigid waters around Antarctica.